When a panther named Bagheera (Sebastian Cabot) finds an orphaned 'man cub' in the jungle, he decides it's best to leave it with a wolf who has recently had cubs of her own. The man cub, now named Mowgli (Bruce Reitherman), has been raised in the jungle for many years. However, the wolf pack leader Akela (John Abbott) has heard the man-eating tiger Shere Khan (George Sanders) has come back to the jungle, and he believes it best that Mowlgi be returned to the man village where he will be safe. Bagheera takes Mowlgi on the long journey to the man village, a task proved more difficult by the fact that Mowlgi doesn't actually want to leave the jungle. 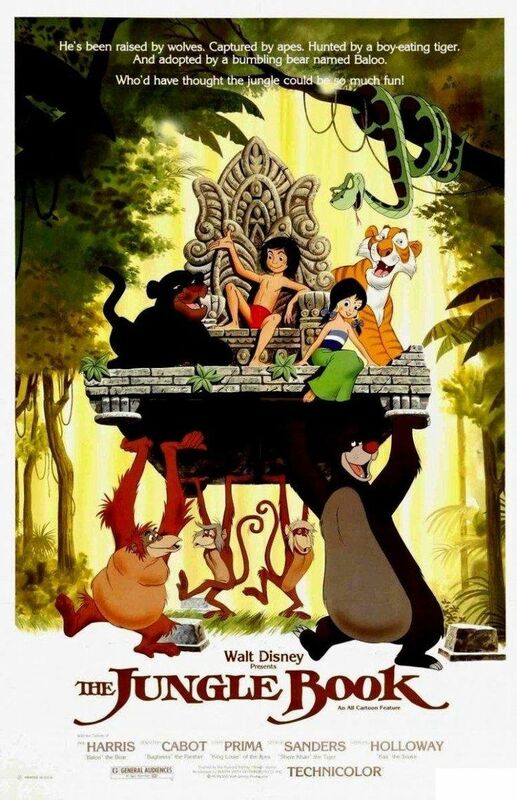 Disney's "The Jungle Book" has the distinct honor of being the last film produced by Walt Disney himself. It is a fun animated adventure musical about a young boy named Mowgli, voiced by Bruce Reitherman, who was raised in the jungle by wolves. Mowgli must now reluctantly be returned to the 'man village' in order to protect him from the man-eating tiger Shere Khan, voiced by George Sanders. That's some pretty deep stuff! A panther named Bagheera, voiced by Sebastian Cabot, leads Mowgli on the adventure as they run into numerous different characters along the way. These characters include a military-like regimen of elephants, a slithery python, and Baloo the Bear, voiced by Phil Harris, who takes to Mowgli quite well and vice versa. The voice acting here is great. Each actor lends their voice wonderfully to their characters to make up a fully entertaining, brightly colored film kids will love and adults will remember fondly. It also boasts the same classic Disney animation we all know and love. It's so classic, in fact, you may even see some of the same character designs in a lot of the other movies from this era as some of the drawings were used more than once. Beyond its voiceover work and bright colors, "The Jungle Book" is also so enjoyable because of its music. It has two songs in particular that have become iconic in the large Disney library of songs. These songs are, of course, "The Bear Necessities," performed by Phil Harris as Baloo, a song about having fun in life by living on the bare essentials, and the other is "I Wanna be Like You," performed by Louis Prima as King Louie the Orangutan. King Louie wants to learn the secret of making fire and this song is the subsequent result. These catchy tunes are both upbeat and jazzy, ones you can really tap your feet to as you wiggle in your seat. I didn't grow up with "The Jungle Book," but BigJ sure did. He loves this delightful animated film filled with interesting, fun characters, some great and memorable songs, and a sweet underlying message about being different, fitting in, and friendship. Even at an hour and 18 minutes, it still might feel a little stretched out and overfilled with characters and colors to compensate for its lack of story, but it's an exciting, timeless adventure that's still a great watch even today (and even as adults!). One year ago, we were watching: "Paul Blart: Mall Cop"